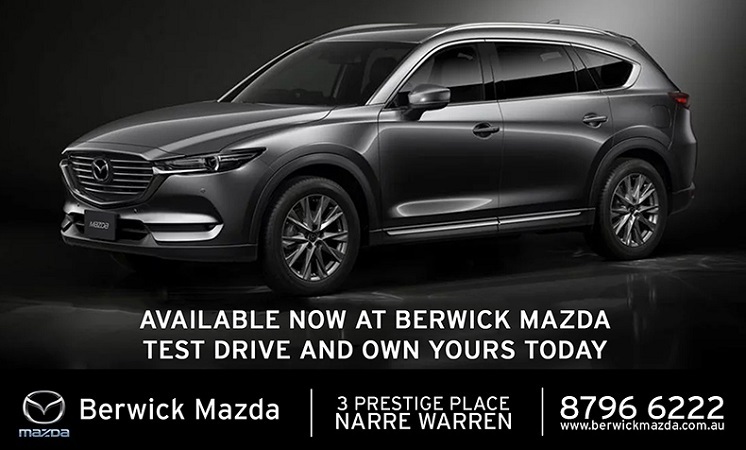 BERWICK MAZDA: BRAND-NEW MAZDA CX-8 IS HERE! The SUV for your family’s future is here! The CX-8 is powered exclusively by Mazda’s SKYACTIV-D 2.2L twin-turbo-diesel engine. It produces a claimed 140kW of power at 4500rpm and 450Nm of torque at 2000rpm. It also has Mazda’s Natural Sound Smoother and Natural Sound Frequency Control, both of which are designed to reduce diesel knock. The result is what Mazda claims to be petrol-engine-like refinement and best-in-class fuel economy of 5.7L/100km combined for the 2WD variant and 6.0L/100km combined for the AWD models. The engine is mated to a SKYACTIV-Drive six-speed automatic transmission, directing drive to the front-wheels in the Sport 2WD model, and to all four-wheels on-demand in the AWD variants, using i-ACTIV AWD, which employs 27 sensors to monitor driver actions and road conditions and then automatically apportions torque where needed. The standard equipment list for CX-8 is extensive, even in the lower-grade Sport, which wears 17-inch alloys with 225/65R17 120H Yokohama Geolandar G98 tyres, and comes with features such as auto LED headlights, rain-sensing wipers, LED taillights, roof rails, 7-inch MZD Connect screen operated via a console-mounted dial, satnav, a 4.6-inch colour TFT LCD multi-information display, a heads-up display (called Active Driving Display in Mazda-speak), three-zone climate control air conditioning and a host of advanced safety features. The NEW CX-8 is available at Berwick Mazda today. Test drive yours today! For more information contact us on 03 8796 6222 or visit our dealership at 3 Prestige Place, Narre Warren 3805 (2 minutes from Fountain Gate, Bunjil Place and Monash Fwy). *Overseas model shown in images.